Sue Pariseau has a long time relationship with clay as she explains, “I’ve enjoyed playing in the dirt since I was able to walk. Mud pies, digging for rocks, gardening, you name it, I had fun doing it. Much later in life, at a community education class, I discovered the joy of playing in clay.” Since that discovery, she’s taken advantage of various community studios and workshops to develop skills and explore firing techniques. In 2001, Pariseau established her home studio in Farmington, Minnesota which allows her to focus on the techniques and colors that speak to her (though it’s sometimes hard to hear over the music). Shortly after in 2003, she established Old Crow Studio in the beautiful bluff country of Southeastern Minnesota. Sue Pariseau loves making pottery people use in their everyday life – for that first cup of coffee in the morning, serving the kids favorite meal or sneaking a bowl of ice cream before bed. She believes each of those occasions and so many others are made more joyful when experienced in handmade pottery. 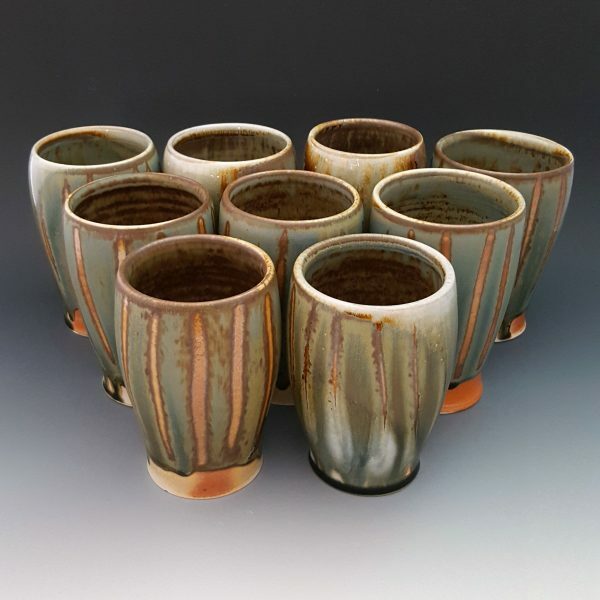 Pariseau’s body of work is split between cone 6 oxidation firing and cone 10 wood firing which allows her to create very colorful pots from the electric kiln, but also some very earthy, organic looking brown pots from the wood kiln.